From time to time, I check in with former Warriors to hear what life is like. Click the hyperlinks to listen to the interviews, and scroll to the bottom of the page for the most recent ones. The very first alumni interview I did was with former D-man Justin Schultz. 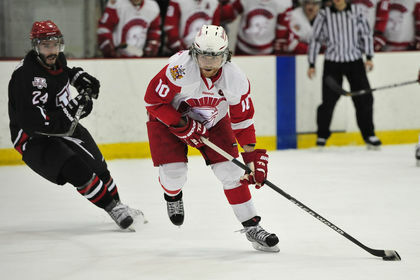 The West-K native had just been ranked as the top-rated defenceman by USCHO. This conversation was recorded in October, 2011, just as Schultz was set to kick off his Junior season at the University of Wisconsin. Click here to listen (runs ~4mins). 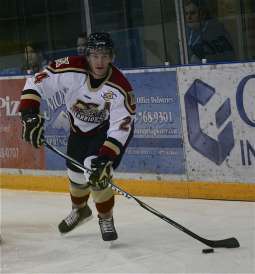 In Oct. 2011, I spoke to former WW Captain Alex Greive, who was fresh off his debut weekend with the Bentley Falcons. Grieve scored Bentley’s lone goal in that loss, and looks poised to play a pivotal role even as a freshman. Click here to listen to my interview with Alex Grieve (runs ~5 mins). 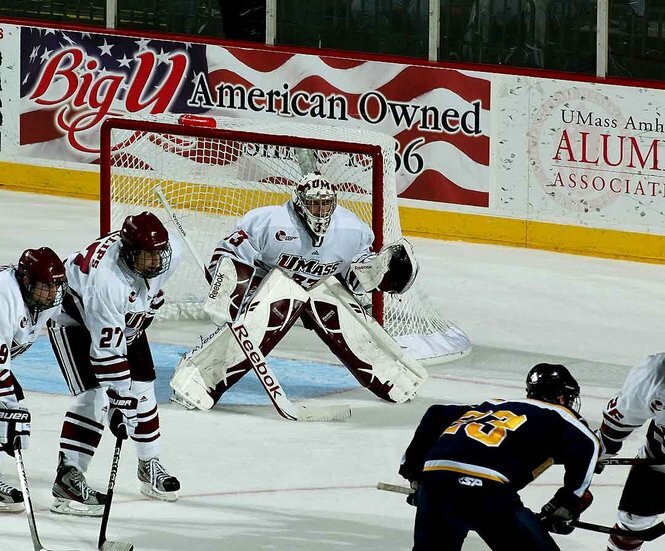 In Oct. 2011, I also spoke with former WW goaltender Kevin Boyle, who was battling for a starting job at Umass, but did get the nod on opening day. Click here for my conversation with Kevin Boyle (runs ~6:30). In Oct. 2011, I spoke with former Co-Captain Joel Woznikoski. 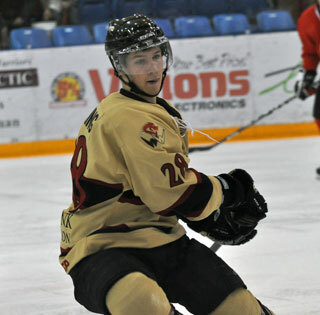 The big defenceman was heading into his second season with the SAIT Trojans in Calgary. Click here to listen to this one (runs ~8 mins). 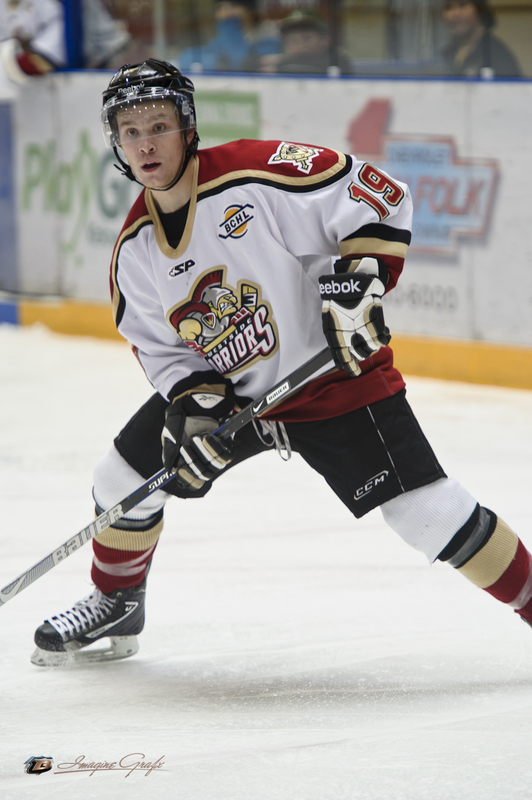 In Dec. 2011, I caught up with Westside’s all time points leader among defenceman. 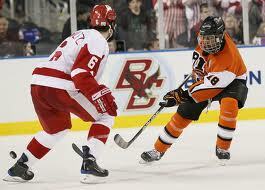 Brendan Ellis was currently in his sophomore season at Merrimack. Click here for that interview (runs ~6 mins). In Dec. 2011, I aired this interview with Grayson Downing. 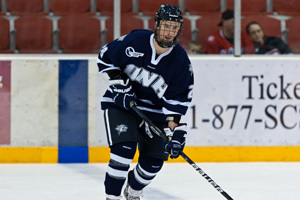 Downing had recently been named Hockey East’s Rookie of the Month for November. In late August, 2012, I spoke with Dru Morrison. The 20 year-old was just about to depart from the Okanagan to head to Calgary. 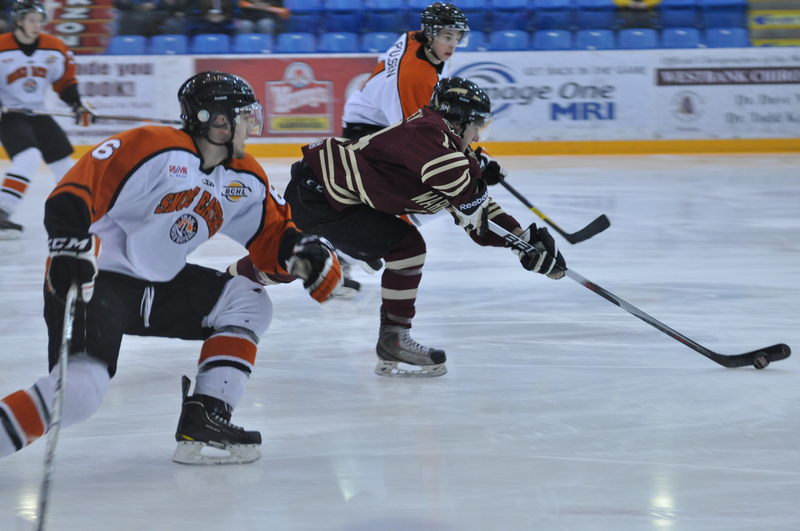 Dru was eligible to play one more season of junior hockey, but he’s made the decision to get on with ‘real life’ after being accepted to the power engineering program at SAIT. Click here for my interview with Dru Morrison. 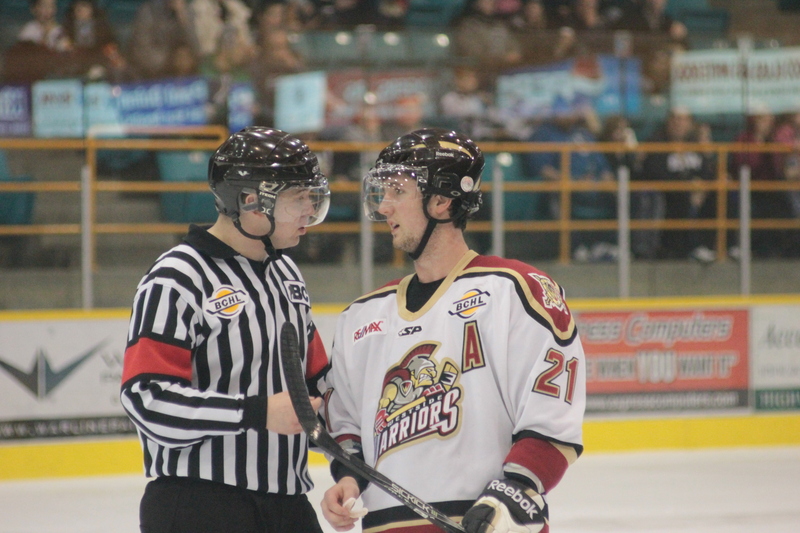 At the first game of the 2012 BCHL showcase, I caught up with former Warriors assistant coach Brandon West – now a full-time assistant with Salmon Arm. Click here for my chat with Brando. In Sept. 2012, I caught up with Connor Dempsey. The Warriors’ 2011-12 leading scorer was just getting into the swing of things in his freshman year at Dartmouth (NCAA). Catch the interview here. 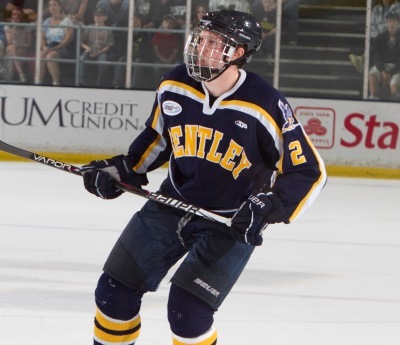 In late Sept. 2012, I checked in with former D-man Matt Maher – currently entering his sophomore year at Bentley University. The Connecticut native told me about his freshman season, life in the NCAA, and taking on more responsibility on the Falcons blue-line. Click this link for my interview with Matt Maher. 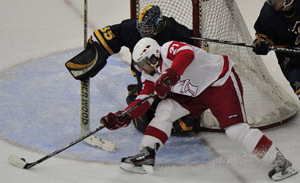 In October of 2012, I interviewed Merrimack Warriors sophomore Kyle Singleton. 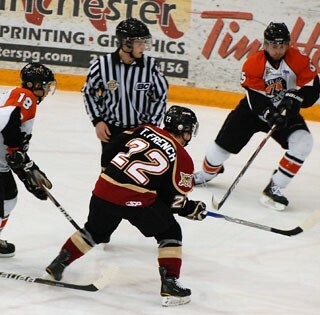 Tyler Krause spent 3 1/2 seasons with Westside before being dealt to Okotoks in his 20 year-old year. He had already committed to Bentley University when dealt, and when I spoke to him in October 2012 he was just getting his freshman year underway. Listen to Tyler Krause here. 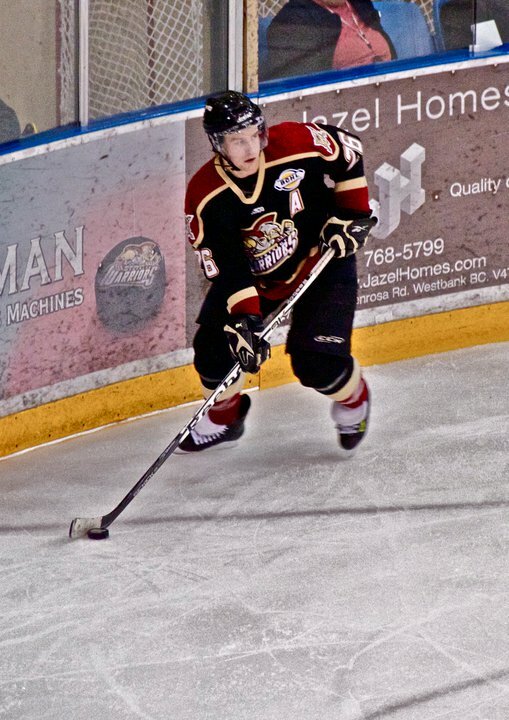 Garrett Watson spent two years playing for Westside before moving to SAIT. Now in his fourth year, Watson is wearing the ‘C’ as he looks to end his Trojans career on a high note. I caught up with Garrett in Nov. 2012. Catch that interview here. Photo by Chris Stanford, 2009. Quinn Gould played just 11 games in his rookie season at Merrimack due to injury, but is now back in business in his sophomore season with the MC. Warriors. I spoke to Quinn in late Nov. 2012. Listen to that interview here. I interviewed Brendan Ellis for a second time when the Merrimack blue-liner was in town for the 2012 Christmas break. He came out for a few practices, and I caught up with him at the rink. Click here for our conversation. I caught up with Alex Grieve a second time in January of 2013. We spoke about his nod as 2011-12 Atlantic Hockey rookie-of-the-year and his sophomore season at Bentley. The first part of this interview has terrible audio quality, but it gets better soon. Click here to catch up with Alex Grieve. 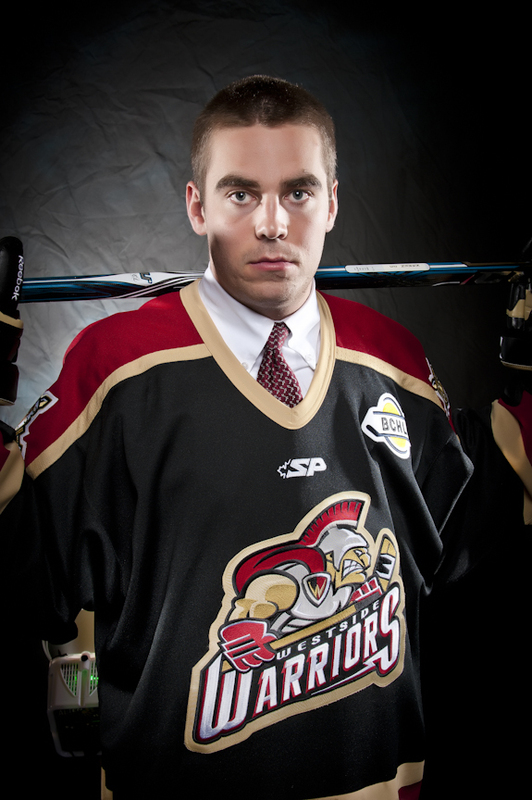 Peter MacIntosh played three years for the Warriors after two years in Woodstock. I caught up with him in February of 2013, shortly after he had finished firefighter training in PEI. Click here to catch up with Peter MacIntosh. 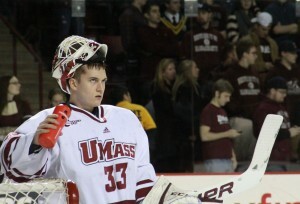 In Feb. 2013 I caught up with UMass goaltender Kevin Boyle for a second time. A native of New Jersey, Boyle told me about his constant battle for playing time and some interesting weather fronts. Click here for Kevin Boyle. 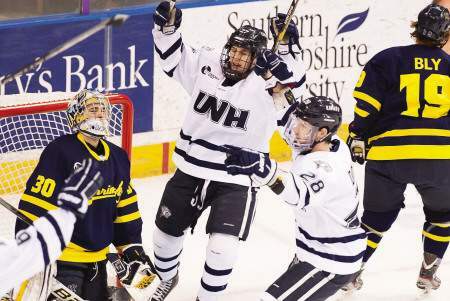 On the same day, I reconnected with UNH forward Grayson Downing – currently the second-leading scorer on the 5th-ranked Wildcats. Click here for Grayson Downing. Just before the 2013 ACAC finals between NAIT and SAIT, I spoke with Trojans and former Warriors sniper Clinton Pettapiece. 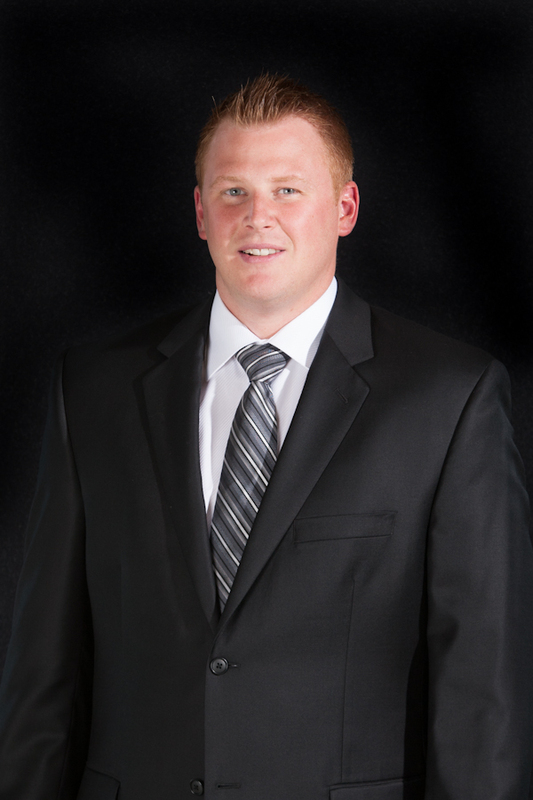 From March 2013, click here to catch up with Clinton Pettapiece. The NAIT Ooks won the 2013 ACAC title, and the week afterwards, I spoke with Tyler French. 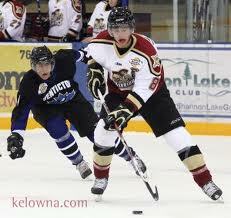 The older brother of Max, Tyler started his BCHL career with Quesnel and finished it at home. He then started his collegiate career at SAIT, before moving to NAIT in the 2012-13 year. Listen to my interview with Tyler here.